The mind does not distinguish between the good and the bad, it knows only two distinctions, deep and shallow. We hardly ever talk about the bus/train/flight we just manged to catch on time, the prize or promotion we just about qualified and many other things we were lucky over scores of other equally probable outcomes. The dominant feeling in this case is relief and it’s quite a shallow feeling. I come from a conservative south Indian family. Even today, we hardly have any family pictures displayed at home. Birthdays were not marked with celebrations or inviting neighbours. It was most likely with just a simple sweet at home. Often but not always accompanied by new clothes and gifts. Not because we could not afford it, but because we did not think it was important. The house was mostly utilitarian except some occasional childish drawings that we put against our desks. If you had no idea how middle class conservatives lived, let me give you some more clues. The glass cups and cutlery were meant only for the guests and special occasions like Diwali. Many new dresses got worn out or grown out from inside the cupboard than my wearing it. The only adornment in our house were some curtains we had bought because my dad was eligible for a reimbursement for that. We were not poor by any stretch of imagination, in fact as a Bank officer my dad was part of the new middle class rich. We lived that way, because that was the only way we knew. I realised that there was another way to live only after I moved to Mumbai and made friends with people from other parts of India. Today, I find it difficult to indulge in anything, sometimes even the essentials. I find it a lot easier to buy my spouse something of high value than I would buy for me. In turn I end up giving the responsibility of fulfilling my needs and wishes to others in my life as I find it impossible to get them for myself. I have given them an unreasonable responsibility and was ready to be upset when not fulfilled to my satisfaction, of course without my mentioning it. I thought it was Hari’s responsiblity to get me a new phone when my old one started becoming less responsive. I was even ready to be upset when it was not forthcoming within the deadlines that existed only in my head. I see many of my married friends do that as well. Even most working women think it is their spouse’s responsibility to pay for the family vacation, get them a new phone, a diamond necklace or whatever caught their fancy. They don’t feel comfortable buying for themselves what they want and abdicate the responsibility for their happiness to their husband. Today, I decide to regain the control of my happiness. I give myself permission to celebrate and be willing to spend on more than on the essentials. I shall let abundance into my life. I will fill my home and life with beauty and experiences that are more than the bare essentials. Life is a journey worth celebrating. May your children/spouse know that their birth is a reason to celebrate, may your spouse know that your coming together is a reason to celebrate. We celebrate Ganesha’s and Krishna’s Birthday over so many years, why not yours, even if you are 47 years. We celebrate Ram coming back to Ayodhya after so many centuries why not your first date, or engagement or first trip together even if if has been 17 years. Celebrate the key events in your life. Make the memories more vivid every year. The key to look back and celebrate these life events are keys to your happiness. 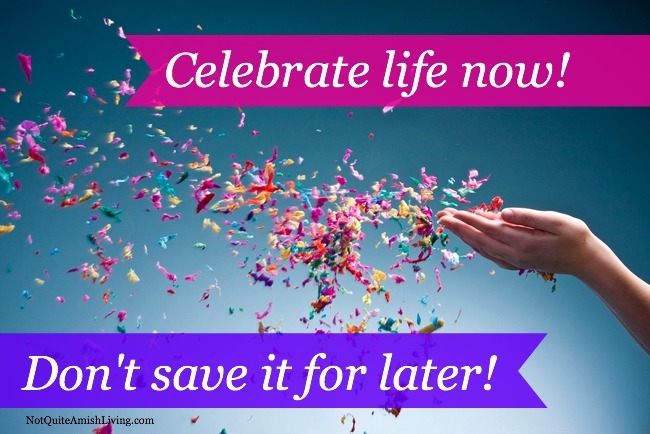 Celebrate life and be the cause for celebration. Fill your life with beauty. Life is too important to give away the responsibility of your happiness to someone else. As for myself, I am working on it ! !